This is my MIL's recipe for a tasty, simple and traditional Mangalorean Daaliso saar(lentil soup). This saar is an excellent companion to plain rice, fried fish and pickle. Thanks to Bindhiya my sil for teaching me how to make it. Dried red chilli crushed: 1 no. 1. Wash dal well and put all ingredients for dal in a pressure cooker, close lid and cook under pressure on medium flame for 2-3 whistles. 2. Wait till pressure drops before opening cooker. Stir dal well and add more hot water to dal to thin it down if desired. 3. For tadka heat coconut/ vegetable oil in a large vessel, when smoking hot add mustard seeds, when it splutters add broken red chilli, curry leaves and cumin seeds. 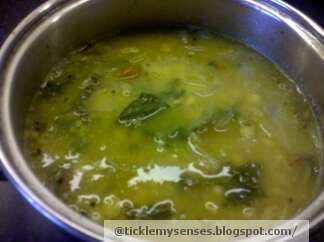 Add hot dal to tadka. Taste for seasoning. Yummy daaliso saar is ready. Serve hot with rice, fried fish and pickle. Thankyou so much for visiting and am so glad you enjoyed the daalisosaar. Hi Daaliso Saar turned out amazing.this is one of my favourite daal..
Hi Daaliso Saar turned out amazing... This is the perfect recipe which I was looking for.